All resistors are 1/4W.The circuit is powered by 9...15V DC or AC. When In Circuit Programming (ISP) connectors are used, is possible the programmer to be powered from target’s power source. Diodes D2 and D6 protect the regulator LM7805, when target’s power is used. 'FAMILY JUMP' is used to select which ATMEL’s family to program, AVR series (ATtinyXX, AT90SXXXX, ATmegaXXX) or 8051 series (AT89Sxxxx). ‘PIC JUMP’ is used to switch between Microchip’s PIC and ATMEL’s microcontrollers. With jumper ON only PIC can be programmed, while OFF can program ATMEL’s microcontrollers. If you don’t need to program PICs, you can leave their board area unsoldered. 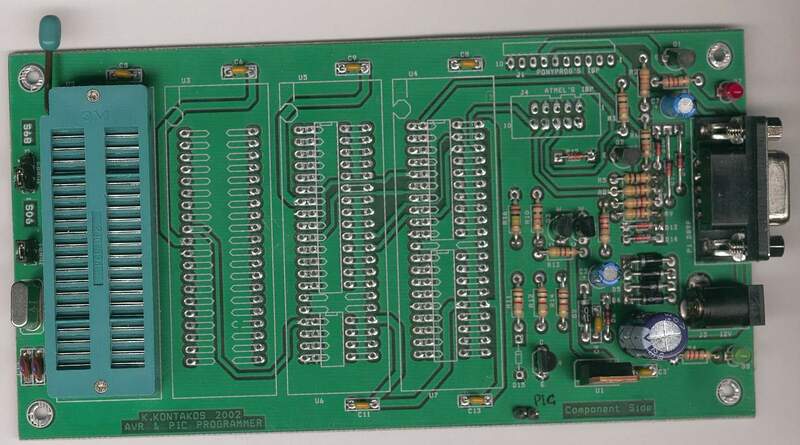 The PCB has been designed so that DIP sockets or ZIF sockets can be used. Because of its cost, it is recommended that only one ZIF is used combined with some pin-arrays to switch between the four different places.